One of the first things my husband Tony and I learned about each other on our first (blind) date was that our fathers both made wine. His dad actually used grapes. A regular event during Tony’s childhood involved taking delivery of a load of zinfandel grapes, stomping them into juice in the backyard and then – well, Tony’s version skips right to the burritos (a rare takeout meal after a long day of grape-mashing), while his father continued to do all the work to make and bottle wine that we still (on very special occasions) enjoy today. My dad, influenced by Euell Gibbons’ books like Stalking the Wild Asparagus, made wines from elderberries, dandelions and blueberries. He kept burlap bags in the back of the car so that he was always prepared to gather materials – you never know when you might run across a nice patch of dandelions – and his foraging habit almost stopped before I was old enough to be embarrassed by it, but not quite. I do remember helping him decant it sometimes, holding the tubing that carried the wine from a 5-gallon carboy into the wine bottles. It spilled all over me once and I still remember the pungent smell of the fermented blueberries, vinegary and sweet. Tony and I do not make wine. We don’t make our own bitters or beer, as some of our friends do, nor limoncello, like Lisa and her family, nor even root beer, as my family did when I was little. 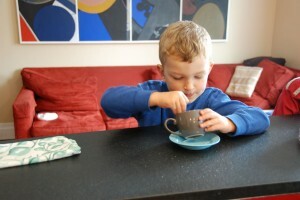 The beverage that gets the most care and attention in this household is probably Tony’s morning cappuccino, which he learned how to make at his father’s elbow as a child, and which he is now teaching the boys how to make. 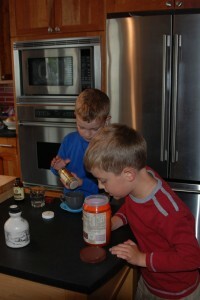 And maybe it’s the influence of that morning cappuccino that has the boys lately making complicated milk drinks. 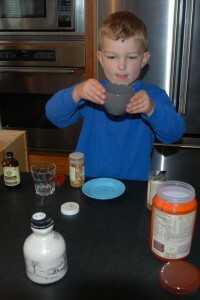 It started one hot day with Eli adding ice to his milk, and has now evolved into a recipe that involves a sprinkle of cinnamon, a few grates of nutmeg, and sometimes a spoonful of Ovaltine and/or vanilla. It reminds me a bit of those old Colonial milk punch recipes (but without the booze). 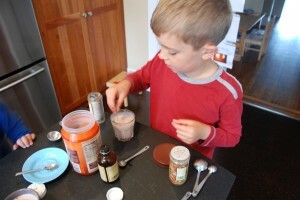 And it’s the only way Ben will drink milk, so I’ll keep putting the ingredients out.